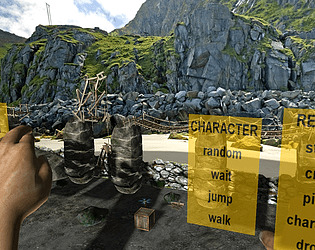 LEAP ARENA demonstrates that the virtual hand controlled by Leap Motion controller can be an important part of the virtual scene and the gameplay. + provides full immersion of the player into the virtual environment. It means that changes in the physical world originate reactions of the object Ai/Animation systems.So the virtual hand controlled by user directly interacts not only with physical objects but with the autonomous AI driven characters and flying drones as well. + is just unfinished sandbox with a lot of open tasks. The biggest challenge is to improve finger tracking technology to stabilize the pose and movement of the virtual hand model.